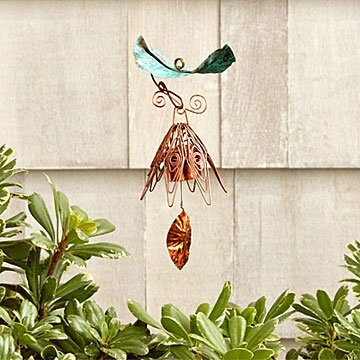 Hang a touch of whimsy on your porch or in your garden with these handcrafted bellflower-shaped chimes. There are more than 500 varieties of bellflower plant, each uniquely beautiful. Their colors vary and they bloom at different times, but each is one of nature's little treasures. Like those bell-shaped blossoms, Lisa Pribanic's handcrafted hanging chimes are charming and unique. To make her stylized flowers, Lisa places a handmade bell inside petals of copper and aluminum wire. She then adds leaves, hand-forged from copper, to the bell's clapper and at the base of the petals. Over time, the leaves' gentle patinas become richer, giving every piece its own personality. Hang it among the bluebells in your garden—or anywhere there's a soft breeze—and enjoy the the tinkling chime as it dances in the wind. Handmade in New Jersey. Colors will vary in small range depending on the metal's mood.